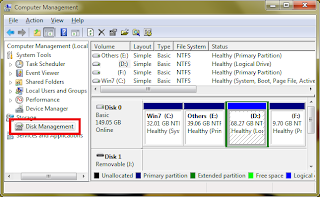 Windows 7 has made it easy to create disk partition without formatting a hard disk. Also you don't have to delete or move your data to do so. To create a partition you should have enough free space to create a new partition and your disk fragmentation should be very less. To partition a drive open a computer management tool. To open computer management window type "compmgmt.msc" in Run window and hit enter. On Computer Management window Select "Disk Management" option, which will display different disk and drives present on your computer. Open Control Panel from Start Menu. 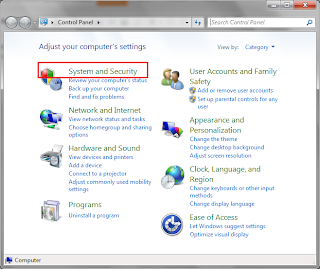 On Control Panel window select "System and Security" as shown above. On "System and Security" window click "Turn automatic update on or off" link. On the Update setting window Select "Install updates automatically" also choose a install update time such that your computer should be up and running with internet connection at that time. So that windows can download and install updates. Click OK and you are done. Windows 7 by default does not display file extension while listing files in explore window. You can change this behavior easily. Open any explorer window. From menu click "Tools" menu. Under "Tools" menu select "Folder Options..." as shown below. On folder options dialog select "View" tab. On "View" tab uncheck the check box with text "Hide extensions for known file types." Now check your explorer window.. it should be displaying extensions for all the files listed. Windows 7 by default display's only folder name on the taskbar. If you have too many folders open, then it becomes difficult to recognize the folder is from which drive. You can change this to display full folder path on taskbar easily. 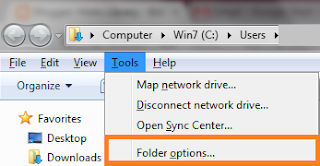 On any explorer window oepn Tools menu, and select Folder Options as shown below. On the Folder Options dialog box select Views tab. Now Select the check box in front of text "Display the full path in the title bar (Classic theme only) " option as shown below. Now look at the task bar. It will be displaying full path for every folder opened. These steps are also applicable for Windows 2008 R2.